Deborah Ray, the owner of Music Bizarre, was one of the first people to take advantage of subsidies and support Council provided to encourage more shop-top housing in early 2016. Deborah had put the plans on hold due to other commitments, and then the March 2017 flood hit. Instead of letting it slow her down, Deborah decided having a secure income would make her more flood resilient and got the renovations back on track. This week her new one- and two-bedroom units are ready to hit the rental market, while above Music Bizarre she is putting the finishing touches to a new vinyl lounge and flood-free storage area. “I’m really stoked with the result. Financially I feel like it’s a very secure investment, and there is a growing need for new types of accommodation to cater for how people are living differently these days,” Deborah said. The Lismore Housing Strategy identified CBD housing was integral to increase housing options in the city, and in 2015 Council brought together a focus group to look at barriers and issues related to shop-top housing. As a result of feedback, Council resolved to waive Section 94 and 64 fees and on-site carparking for shop-top housing (subject to conditions) and to work closely with property owners to help them meet the necessary fire regulations, which can be complicated and costly. “CBD shop-top housing is a great way to ensure we have smaller types of accommodation to cater for singles and couples, which is a growing demographic. The three-bedroom home is often not a model that suits the way people are living in the 21st century,” Council’s Strategic Planning Coordinator Paula Newman said. Anyone interested in pursuing shop-top housing should phone Council’s Economic Development Manager Tina Irish on 6625 0458. 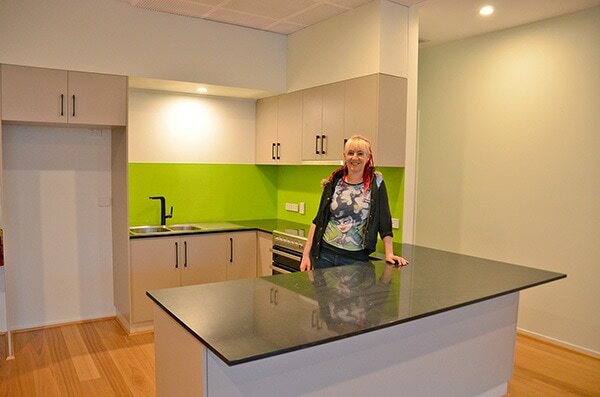 Image: Deborah Ray in her new shop-top apartments in the Lismore CBD.